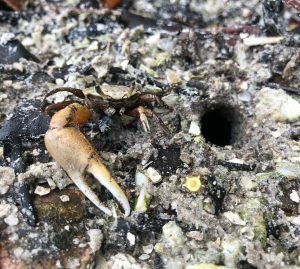 Florida’s members of the fiddler crab genus, Uca, make their home in the tidal sands of mangrove forests. These crabs are experts at living with the daily flow of water in and out of their habitat. Fiddler crabs get their name from the male’s large claw. While it may look useful for defending itself, the large claws are primarily used to woo a female in an intricate courting dance. The males wave their claw until a female accepts his invitation to his burrow. The female will spend two weeks incubating her eggs underground and will time the release of her eggs with the highest high tides. The newly-hatched larvae travel out to sea with the currents. Several weeks later, the young that survive drift back into the estuary and settle out of the water column to join an existing crab colony. The burrows serve as a survival mechanism in addition to their role in the fiddler crab life cycle. While found on land, fiddler crabs are equipped with gills and must keep them moist in order to get oxygen. However, too much water can drown them. The burrows serve as both a source of moisture at low tide and a dry haven at high tide. Fiddler crabs detect the vibrations of the incoming tide, retreat to their burrows, and plug the entrance with sand or mud, sealing them safely inside until the tide retreats. 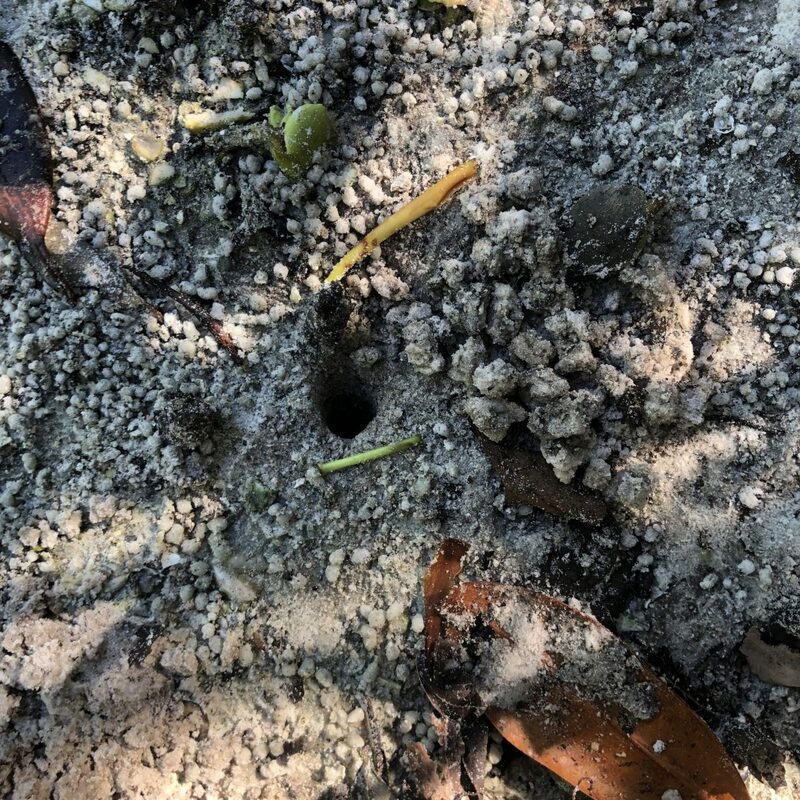 The entrance of a fiddler crab burrow is often dotted with balls of sand. The larger spheres are excavation pellets, removed from burrows by the crabs as they build and maintain them. The smaller pellets are the result of the crab’s unique feeding style. Using their small feeding claws, the fiddlers will gather sand in their mouths, extract the nutrients, and spit out the clean sand. If you look closely, you can notice a difference in color between these feeding pellets and the surrounding sand! These delightful decapods are most active at low tide. You can find them in the hundreds feeding, courting, or tidying their burrows in the sand. Keep an eye out for these active crab colonies next time you’re near the mangroves!